Effol Hoof Ointment Black for Horses is suitable for use on all types of hooves. This special formula encourages the healthy growth of hooves, preventing hoof disease as well as strengthening hooves and maintaining their elasticity. 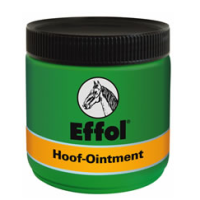 Effol Hoof Ointment also acts as a barrier against dirt. Vaseline, bay oil and thyme.